I counted todays lunch with one of my VT sisters as message-received for the month, for her anyway. I had planned to make families dinner this month, but I decided that before I knew I'd be feeding an army when Mitchy goes to Thailand. My eyes have been opened to her understanding of what's happening to her. I think she's an inspiration because she's upbeat and not letting what's happening to her lead her to a place where a lot of ill people go emotionally. She even joked about her illness. That in itself is brave. Selfie! Not really. Subway Surfing. A few nights ago I received some fabulous photos from Mitchy of Mitchy. The message under it advised that those set of photos were the photos to use in the event she goes missing in Thailand, but I looked through some photos and decided that this one best represents her. 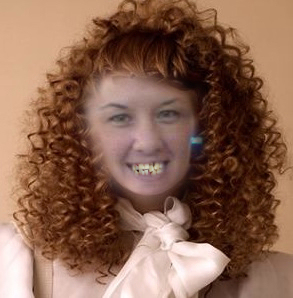 "Last seen with a freckled girl with a perm and bad teeth".